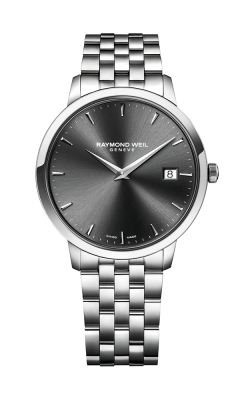 Inspired by the rhythm of classical and modern music, the Swiss-made timepieces of Raymond Weil are sleek and stylish pieces of modern horological innovation. More than the sum of their parts, Raymond Weilâ€™s watches confidently feature exquisite stainless steel cases, genuine leather bands, and accurate complications that include precise chronographs, simple-to-use subdials, as well as bold tourbillon style detailing. Proud to be a part of this ongoing musical legacy, timekeeping enthusiasts are certain to find a seemingly-endless selection of menâ€™s and womenâ€™s watches from Raymond Weil today at Costello Jewelry. As an authorized retailer, customers to Costello Jewelry Company will find a selection of some of the most popular and most requested menâ€™s and womenâ€™s Swiss watches of Raymond Weil. Popular Raymond Weil womenâ€™s watches on display at Costello Jewelry Company include the subtle and chic pieces of the Toccata and Tango collections, and the fashion-forward models that make up the one-of-a-kind Shine and Noemia timepiece lines. 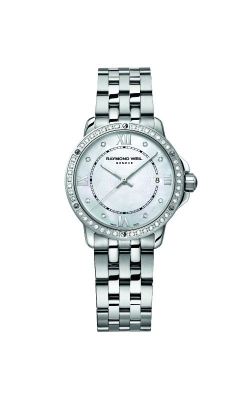 Sophisticated and elegant, these Raymond Weilâ€™s timepieces of the womenâ€™s Shine and Noemia collections feature mother-of-pearl dials, diamond-adorned bezels, and are the perfect fashion accessory for the modern woman on-the-go. Further, available at Costello Jewelry Company is a large selection of Swiss-made diver, racer, and fashion-style menâ€™s timepieces by Raymond Weil. Firstly, from the Nabucco and Freelancer timepiece lines come models that are long-lasting and durable, ideal for the fashionable man-about-town. Also on display now at Costello Jewelry Company are the menâ€™s Raymond Weil models of the subtle Toccata and Tango collections, as well as the music-inspired pieces of the Maestro collection. Notable models featured in the Maestro collection include the limited edition 2237-ST-BEAT2 and 2237-ST-BEAT1 timepieces, which pay tribute to the legendary sounds of the Beatles. Why Shop at Costello Jewelry Company? Family-owned and operated since 1979, Costello Jewelry Company is proud to be the Glen Ellyn and Naperville areaâ€™s source for the best in todayâ€™s fashion jewelry, bridal jewelry, and Swiss watch fashions. More than just an authorized Raymond Weil retailer, Costello Jewelry Company offers an array of timepieces from designers such as Carl F. Bucherer, Tissot, Maurice LaCroix, Michele, and Klokers, along with fine jewelry by Aspiri, Coast Diamonds, Doves, Oscar Heyman, and more. Additionally, to ensure that every watch stays exquisite and precise for generations, Costello Jewelry Company extends complete timepiece repair and cleaning services, completed entirely on-site.